Godfrey is a two-toned little owl sculpture with swirly-twirly eyes— which were made from the impression of an old gold button. His beak was stamped with a diamond shaped costume jewelry ring and a square hardwood stamp was repeatedly impressed around each eye in a radiating pattern. Two textured folded wings cover his backside along with the artist's signature stamp. Two glazes were layered on this piece to achieve his unique coloring: a base of white and a brown translucent glaze that pooled in all the recessed areas on Godfrey. Godfrey is a sturdy little fellow, measuring a smidge over two inches tall, 2.5 inches wide and 1.5 inches in depth. 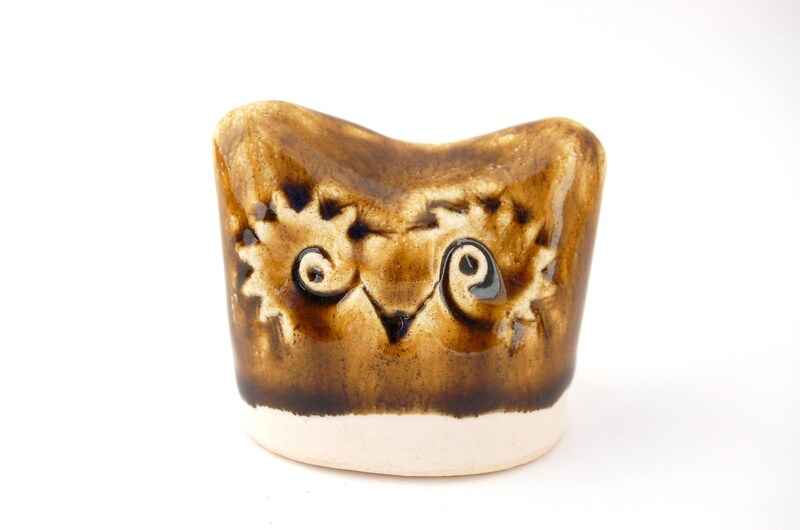 He has sweet, bright eyes and neutral coloring, making him a great gift for that owl lovin' someone— or yourself!